This duck species is a member of the wood duck group and is one of the smallest ducks in the world. Like all wood ducks, the Ringed Teal has a distinctive gait. When walking on land is appears almost to limp. They are agile, strong fliers and are also known as “perching ducks”. DESCRIPTION: Ringed Teals are wood ducks that are 14 to 15 inches in length. They only weigh about 12 ounces. Their wingspans are approximately 28 inches across. They have brown eyes. Ringed Teals have slender gray-blue bills that have many tiny, plate-like ridges along the edges called lamellae. The lamellae are coarse and allow them to cut vegetation like teeth. Ringed Teal adults have beautiful iridescent green plumage. They can be identified especially by the white patch in front of a bright green patch of plumage (called the speculum). 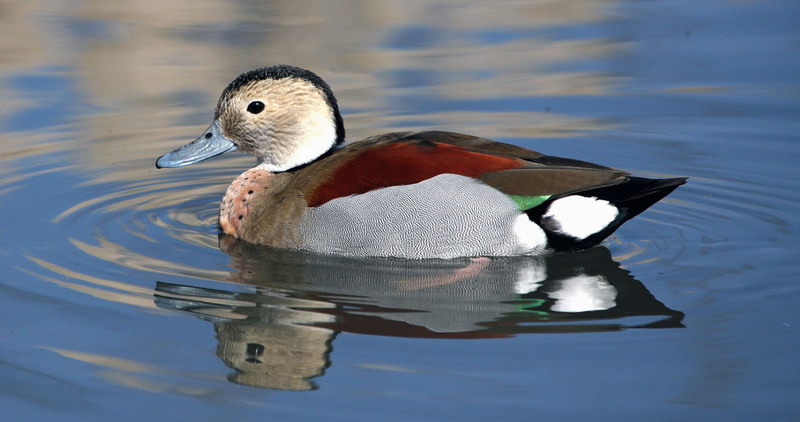 The male Ringed Teal, called a drake, has a speckled, pinkish breast and a light tan head that is bordered by a striking black line of plumage. The black line extends down to the base of the neck and then partially around it, forming an incomplete ring. Males also have dark, chestnut backs and gray flanks. Female Ringed Teals, called hens, are less vibrant. They have an olive brown back, a barred chest and belly, and white blotches on the head. They have a dark tail and pale rump. Ringed Teals have light pink legs and toes with sharp strong claws that allow them to perch high in trees. They are considered dabbling ducks. Dabbling means they swim and dip their bills, heads and necks into the water to filter out and forage for food but they do not dive or submerge their bodies underwater. Ringed Teal females’ vocalization is a harsh “quack”, while the males’ is a soft, long whistle. RANGE: Ringed teals live in forested wetlands in South America from southern Bolivia, Paraguay, and southwestern Brazil, to northeastern Argentina and Uruguay. HABITAT: They live near secluded pools, small streams, swampy tropical forests, ponds, marshy clearings in low woodlands, and often in forested habitats. FAMILY LIFE: Ringed Teals form strong pair bonds, which may or may not be life long. They nest in holes or other tree cavities that they have lined with down. They lay an average clutch of 6 to 11 eggs. Both parents help incubate the eggs. The ducklings are precocial, meaning they are well developed when they hatch. Once the eggs have hatched the parents leave the nest. The ducklings will follow by leaping from the nest. They waterproof their feathers by rubbing against their mother’s abdominal plumage. They follow their mother to water and eat on their own. They are able to fly approximately 53 days after hatching. LIFE SPAN: The average life span is 13 years in the wild or in human care.